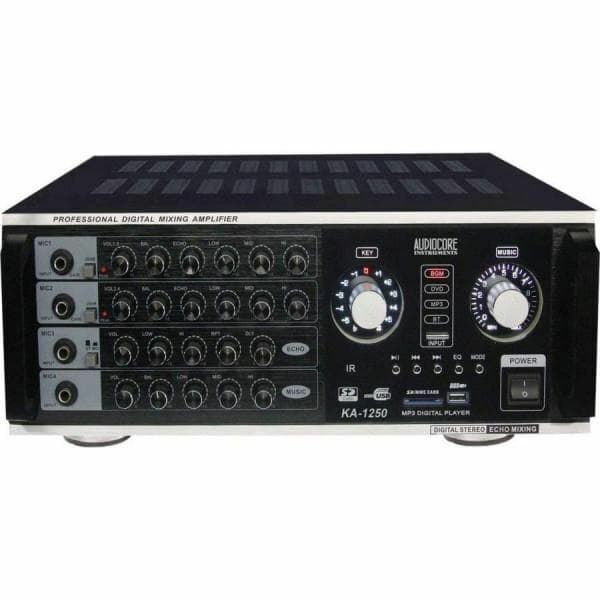 Audiocore is a world leader in the field of professional audio equipment. Audiocore mixing consoles and amplifiers are used in many of the world’s top recording studios and music venues, setting the standard for pure, natural sound. This expertise and experience are behind the creation of the KA-1250, so it delivers powerful output with clear, rich sound that’s perfectly tuned to make voices sound their best. It's also suitable for bigger speakers such as 10", 12", and even 15". The sound is full and dynamic, and the left-right delay time gives a wider stereo effect than ordinary echo. The KA-1250 offers Echo Modes, every song and every singer sounds great! You can also adjust the key and the pitch by increasing or decreasing the basic key. Using sophisticated Engine technology, this amplifier delivers 250W of clean, reliable power for each channel (2x250 watts). Its high efficiency means it operate with low heat and low noise, and unlike ordinary analog amps do not require a low-pass filter that degrades audio quality. Designed to maximize quality from microphone input, the sound has good response in all frequency ranges, low distortion, no coloration and plenty of power in the midrange for dynamic vocals. The large control knobs are four-gang rotary encoder types, ensuring smooth, responsive operation with a professional feel. The volume knob has LED number indications, so it is easy to see in a room with low lighting. The KA-1250 has 4 front mic inputs and equipped with USD, SD Card, AV, and Bluetooth connection as well. In addition, it provides 4 audio output (2 left and 2 right) with recording output channel. Silver Crest CK30 Amplifier Keyboard..
Fender Rumble 40 v3 Bass Combo Amplifier Great RUMBLE tone at a volume made for practice. The new Fender Rumble V3 1x10” 40W bass combo is an ideal choice for practice, studio or rehearsal, with its great tone, small size and easy-to-use controls. Besides the 1x10” Fender special design speaker, i..